Chikatsuyu-oji sits at the entrance of a small town, its name—近露王子—carved into a tall stone tablet. The characters are written in calligraphy of a flowing style. The strokes are thin, but edged and strong. Tall trees shield the tablet from rain and sun. We’ve passed a half-dozen “ojis” in the mountain— Takijiri-oji, Inohanna-oji (meaning something close to “hog’s nose shrine”)… An oji is a spiritual marker that cleanses the soul. The name of each oji is carved into a tablet of stone, some small, others big; some thick and sturdy, others worn-down and frail; their stories lost to the mountain breeze and summer squalls. We were in town, but still had no clue where our night’s accommodation was. We had booked a minshuku here, one known for its mouth-watering dinners and breakfasts. A few kids were just getting out of school. Leading them was the oldest in the flock—a girl with jet black hair. Quiet, her eyes spoke kindness and strength. We greeted her and gave her the name of our minshuku. She signaled us to follow. So, we joined them on their daily journey home. She took us across town, across the main street that led back into the forest, carefully checking both sides of the road before letting the ducklings pass. We followed. This ordinary journey, is what I remember about that day. The next morning, we passed an old cemetery on our way back into the mountain. 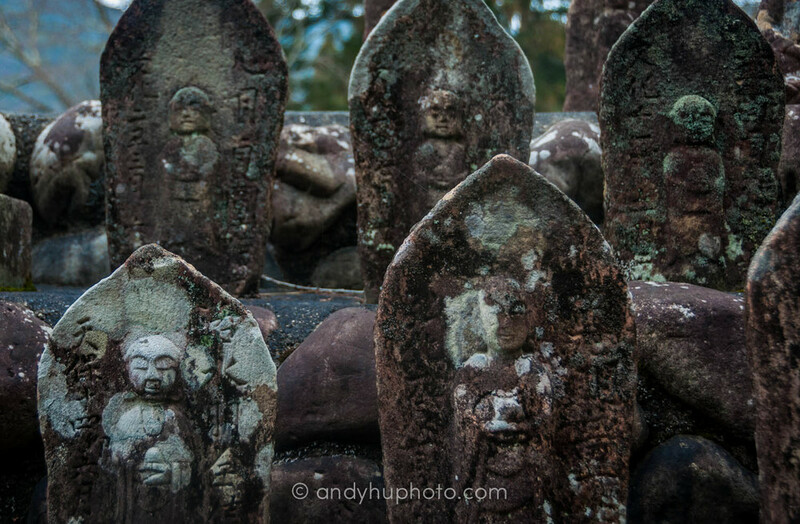 Rows of stone buddhas stood quietly, side-by-side, waiting for the colors to return. A hundred pink petals scattered around them.